The first thing to establish is that there is no generic answer to this question, it all comes down to competition, the company your dealing with and how well known the brand already is before the campaign starts. The purpose of this post is not to give a definitive answer to how long but to show the stages a brand and website must go through to achieve good results and the dangers of pushing SEO to much in a short space of time. Google regularly crawls your website (as do most of the search engines), the search bot crawls websites, finding links and adding new websites, content and information into Googles database. When you do a search on Google your not actually searching the web, your searching Googles index of information and clicking a link to the website, this is why you may notice it takes sometime to update. The first step towards a successful campaign is to get your website indexed, an SEO specialist will usually use Google webmaster tools to submit a sitemap to Google, A sitemap is a file containing an easily readable map of your websites pages which help Google to index your website. This should only be done after your website is reviewed to ensure all the content is useful, unique, relevant and that it provides a good all round user experience. Indexing your website is just the very start, this just means your website will be recognised by Google but this is not going to make it rank well for the keywords people search for in order to find what you do, in order for Google to trust your website it has to gain authority. Part of gaining authority is a waiting game, to show Google you are here to stay, the other part is to gain authority from other high authority websites giving Google the green light that your website is also a trustworthy website. You need not only these websites to be trusted but also relevant to your website in order to make an impression. 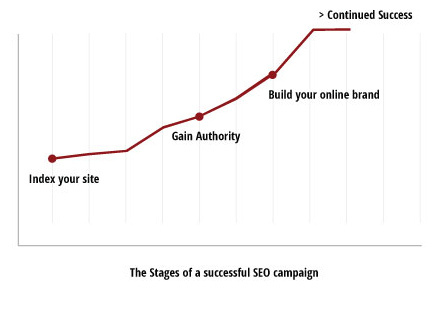 Gaining authority is the only way for your website to cement its place on the search results, often in the early stages we see websites rank well in a short space of time but only FOR a short space of time, its not about getting your website to rank but about keeping it as a well ranking trustworthy and useful website. If you haven’t already noticed, often in the search results you see big, household brand names ranking well for a number of keywords, this is achieved from building an online brand. To build your online brand there are a number of things you can do, firstly it is important that you put your name to everything you do, if there is a link to your website ensure it contains your brand name, add your postal address to your website and Google+ profile to. Google in 2013 loves brand names and its easy to see why, after all if you consider people when visiting a website will be more likely to remember a brand name than a URL. You can reinforce your brand name with your social media, ensuring you have a presence on all of the latest platforms, further enabling visitors to get involved and interact. Google sees two websites, both have interesting content, both are relevant to what the user is searching for. The difference is that one also has a known brand name and social media platforms for its users to interact or find out further information, its a no surprise that the second one will be likely to rank higher. 4- It doesn’t end there..
For some people when their website is ranking highly and converting traffic its easy to just sit back and say that’s that, which is a very dangerous approach. If you look at the process of getting the website to rank highly it means you have potentially over taken 100′s of websites on your journey, What is going to stop anyone else doing the same to yours? – Well the answer is to keep at it, grow your online presence and ensure that no one will ever catch you. Consider how everything online is rapidly changing and that means you need to keep up. Over the past years Google has released at least one minor update every month and one or two big updates (pengiun & panda) having a huge effect on the search results and what is now expected from a website. There are constantly new methods and products available (such as Google+, pinterest) that you need to understand and be involved with. Why can’t this be done quicker? It’s all down to the search engines and what they expect from your website, if one day your a company with a website that no one has every heard of and then the following week you appear to be the most talked about thing in your industry its very likely that the tactics used are unnatural and that you’ve been involved with spam to try and promote your website quickly, that’s why a natural growth through internet marketing is needed, providing useful resources and being linked with other trusted website and social media to slowly build your online brand.